Russian stocks are expected to remain in the red Thursday, as the EU summit held in Brussels a day earlier added to the fears of a messy Greek exit from the Euro. Falling oil, that sank to its lowest this year Wednesday, is also pressing the stocks. “The dominant sentiment in markets today is most likely to be one of confusion. Investors are more likely to remain sidelined while waiting to hear details and interpretations from yesterday’s very unclear EU Summit,” said Chris Weafer, a chief strategist at Troika Dialog. As for the news coming, the comprehensive Purchasing Manager Index (PMI) reports for all major economies, as well as the aggregate Eurozone number are to be released on Thursday. Among other important data to come out is the IFO business confidence and expectations survey in Germany. In the US, the weekly data on jobless claims as well as April durable goods report are in the diary. In Russia, Severstal is to report its 1Q12 results under IFRS. European Union leaders concluded their latest summit with few concrete steps to fix the continent's festering financial crisis. This is making analysts increasingly skeptical that European leaders will succeed at preventing Greece from dropping the euro or agree on ways to jump-start the region's economy. In oil markets, Benchmark crude lost $1.50 to $90.37/bbl in New York, after falling as low as $90.18/bbl earlier in the day. Both the RTS and the MICEX ended Wednesday trading session deep in the red. 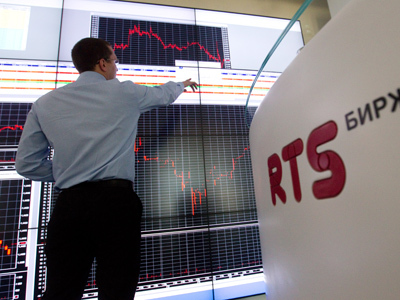 The RTS lost 4.38% to end at 1, 263.96, with the MICEX dropping 3.42% to 1, 256.55. Worries about Europe overshadowed encouraging news from the U.S. housing market. The Commerce Department said sales of new homes rose solidly last month, adding to evidence of gradual improvement in the housing market. Americans bought 3.3% more homes in April, led by strong gains in the Midwest and West. ChelPipe, Russia’s leading pipe producer, and Polymetall, the country’s biggest gold producer as well as one of the world’s largest silver producers, were the market leaders on Wednesday, adding 0.61% and 0.19% accordingly. Energy and steel and mining sectors were the market outsiders, with OGK – 5 nosediving 12.18% and Mechel plunging 10.54%. 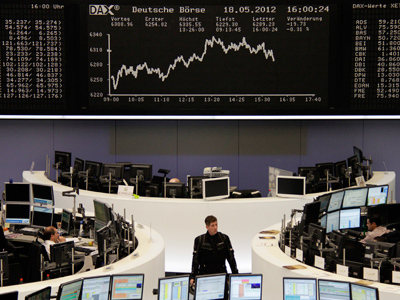 In European trading, Germany's DAX and France's CAC-40 closed more than 2% lower. 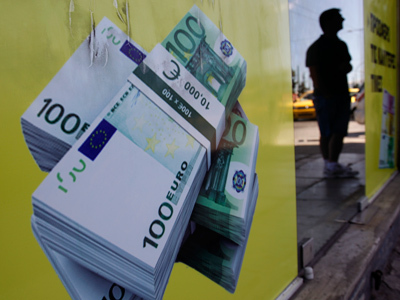 The euro continued falling against the dollar, reaching $1.25 – its lowest level since July 2010. Concerns about the stability of the European currency union if Greece leaves have knocked 5% off the euro this month. Europe's struggles come at a time when Asia is also slowing. China's economic growth fell to a nearly three-year low of 8.1% in 1Q 2012 and industrial output in April grew at its slowest pace since 2008. Japan's benchmark Nikkei 225 was marginally down at 8,550.62, while Hong Kong's Hang Seng fell 0.2% to 18,749.19. 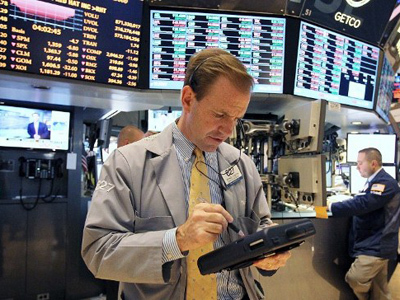 The Dow Jones industrial average fell 0.1% to close at 12,496.15. 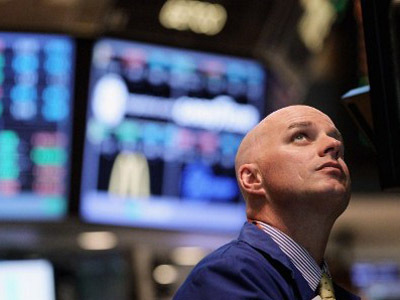 The Standard & Poor's 500 index rose 0.2% to 1,318.86, while the Nasdaq rose 0.4% to 2,850.12.